In Canada today, helping Muslim girls is “racist”: Edmonton Transit last year caved in to Islamic supremacist demands and took down bus ads sponsored by my organization, the American Freedom Defense Initiative (AFDI), offering help to Muslim girls who were living in fear of honor killing. But we are fighting back: we’ve initiated a court action to defend free speech – which is supposed to be protected by the Canadian Charter of Rights and Freedoms. The ad was designed to provide Muslim women and girls with help, should they feel threatened. The ad was also designed to challenge and repudiate the opinion that honour killings are in any way acceptable or justified. The ad also sought to change public attitudes, to bring support for gender equality and the rule of law. The ad featured seven women who were honour killed because they preferred to live by Western and progressive values rather than medieval or fundamentalist values, and to assert their equal dignity as human beings. Honour killing typically occurs because a woman is considered to have sullied the family’s honour through some sexual indiscretion or even through perceived immodesty; her killing is considered to cleanse the family’s honour. Increasingly in both the U.S. and Canada, free speech is only allowed to those whose positions are popular. But the whole purpose of free speech, the foundation of any free society, is to protect people who tell unpopular but necessary truths. If any group has the power to censor messages it doesn’t like, society is no longer free. Honor killing is a grim reality that is largely ignored, and girls are suffering as a result. Muslim fathers kill their daughters for real or imagined sexual indiscretions that have supposedly dishonored the family. Nothing is done because political correctness prevents us from speaking about the problem honestly. Muslims commit 91 percent of honor killings worldwide, and Islamic law stipulates no penalty for a parent who kills his child. Honor violence, honor murder, is not just a tribal custom; it’s Islamic law. Girls threatened with honor killing need and deserve protection. The horror of honor killings is given the imprimatur of the West by the enemedia’s complicit silence and the government’s unwillingness to say a critical word about Sharia, no matter how savagely it is applied anywhere in the world. Please help us. We have to make a stand. Please donate via Paypal. Stay on top of what’s really happening. Follow me on Twitter here. Like me on Facebook here. TORONTO – When Edmonton Transit rolled out bus ads reading “Muslim Girls Honor Killed By Their Families,” asking “Is your family threatening you? Is there a fatwa on your head?” it caused complaints of discrimination and racism that resulted in their removal. Now—nine months later—the New York-based non-profit organization that paid for the transit ads is suing the city, claiming the removal violates freedom of expression. “The City of Edmonton has silenced the voice of a non-profit group that wants to assist Canadian women and girls, protect them from honour killings, and promote gender equality,” said lawyer John Carpay, president of the Justice Centre for Constitutional Freedoms (JCCF) in a release. “Cities cannot discriminate based on content and bus advertisements are an open, public forum and just because a few people complained, that’s not a valid reason for the city to pull the ads,” he told Global News. The JCCF is representing the American Freedom Defence Initiative (AFDI), the group that paid for the advertisements. The images showed Canadian and American girls, including 16-year-old Ontario resident Aqsa Parvez, who was strangled by her father and brother after rejecting cultural traditions of her family and an arranged marriage. 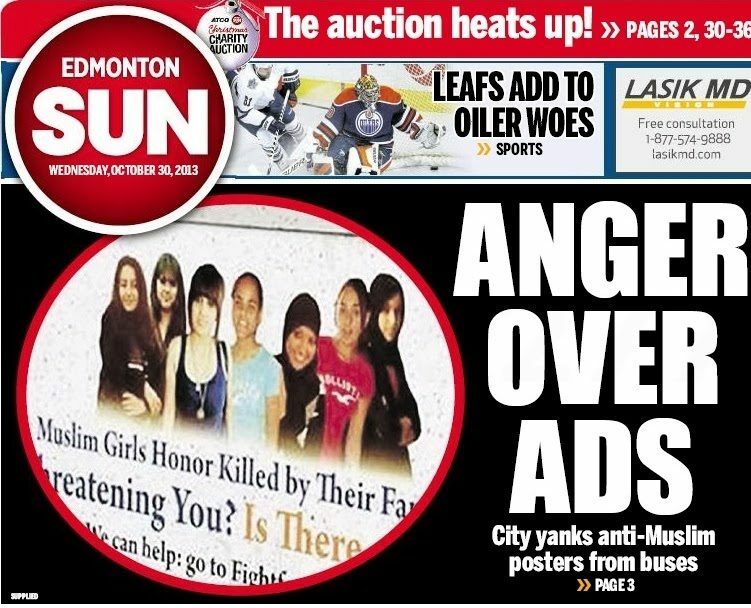 The bus ad featuring female victims of honour killings that’s at the centre of a suit against the City of Edmonton. Commuters were advised to visit FightforFreedom.us to get “help,” as listed on the ads. AFDI’s Pamela Geller said that help could come in the form of access to a support system of former Muslims or Muslims who’ve experienced the same problems, or access to a safe house. A city spokesperson said it wouldn’t be appropriate to comment on a case that will be before the courts, but explained the reasons for removing the ad. Edmonton Transit vehicle advertising must meet Advertising Standards of Canada requirements, which contains 14 clauses on criteria for “advertising that is truthful, fair and accurate,” wrote Cheryl Oxford. City councillor Amarjeet Sohi contacted Edmonton Transit after receiving complaints last October, when he told CBC he found them to be unfairly singling out one community. “Honour killing is prevalent in many other communities so why only single out one Muslim community? The organization behind these ads is known for its anti-Muslim stance.” Sohi couldn’t be immediately reached for comment on the court action announced Monday morning. She said the ads were only up in Edmonton for between 24 and 48 hours last October, but hopes to expand the ad campaign after the court case. The case will be heard Feb. 20, 2015 by the Alberta Court of Queen’s Bench.